To unlock the doors to personal excellence, every accomplishment begins with the desire to succeed and urge to reach to one’s full potential. K.R. Mangalam World School believes in developing the various facets of students’ personality to make them realize their innate talent. It was a proud moment for the school as Vivaan Madhok, a combination of talent, academic excellence and leadership abilities, scripted success by bagging the NIE Student of the Year award for the session 2016-17. He was nominated among the other top achievers. 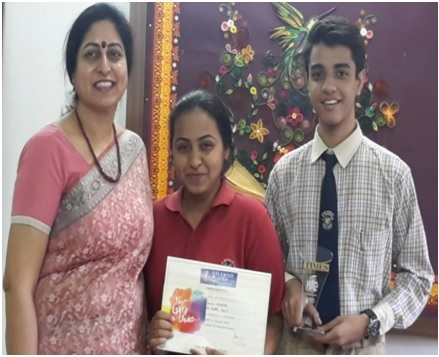 An avid reader, an excellent debater and a tech enthusiast, Vivaan has taken part in many presentations, debates and group discussions at the Intra and Inter-School level Competitions. The award was given on the overall performance of the students. The Principal Ms. Alka Awasthi congratulated the students for their commendable performance.